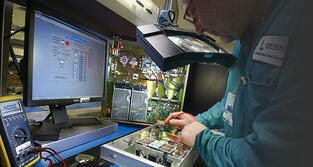 What Services Does An Electronic Contract Manufacturer Provide? Whether your electronics business is thinking about seeking out help, or if you already use a third party service, it is very important that you know how to get the most value from your relationship with an electronic contract manufacturer. Although overseas partnerships may offer little more than mediocre product assembly, a qualified and professional service will be able to assist you in numerous areas. To ensure that you enjoy the most benefit from your outsourced help, here are several services that you should expect from your electronic contract manufacturing company. Efficiency during the design phase is crucial to ensuring that your project goes smoothly. In order for your business to develop a product that your customers will be satisfied with, your team must take the time to carefully understand consumer demands and craft an electronic device that will be able to handle numerous functions while still being relatively simple to operate. Unfortunately, this often proves to be more challenging than it sounds. In some cases, a highly sophisticated project may create complications and roadblocks for your engineers and designers as they must look for ways to overcome obstacles and create an efficient and effective product. If they are required to throw out their schematics and begin from scratch due to issues, you could begin to lose a great deal of money on the man hours invested in the design phase alone. In cases like these, it may be in your best interest to consult with professionals at an electronic contract manufacturer With the help of a fresh pair of eyes, your team can get back on track faster so that your business will become more productive. A reputable electronics contract manufacturing service will have been in the industry long enough and will be respected enough to have forged positive, lasting relationships with parts suppliers. As such, your outsource partner should always be able to manufacture your electronic devices with top quality parts, system components, conductors, capacitors, resisters, etc. In addition to this, your partner should be successful enough to be able to maintain the latest and greatest technologies for product assembly and manufacture. State-of-the-art equipment will provide you with the peace of mind that each of your products will be carefully and precisely assembled to reduce equipment flaws and to improve your reputation. Be sure to verify that your partner remains compliant with electronics assembly standards so that your products are always safe for your customers. Your electronic contract manufacturer should be interested in more than just pumping out devices quickly. With a passion for quality and customer satisfaction, your partner will take pride in a job well done by consistently and regularly testing your products for functionality and operability. Should any problems or faults be detected, your device(s) will be evaluated promptly to quickly determine the root of the problem. In this way, any corrections, repairs, or improvements to your products can be made quickly - and before the product reaches the end-users. In the event that one of your products is sent back by a client due to a flaw, it is important that you are able to identify the problem and remedy it quickly. Unfortunately, this can be very time consuming - especially if you have limited labor resources. In this case, it's smart to have an electronic contract manufacturing partner who is able to quickly troubleshoot for the fault and make repairs to the product. This will allow the device to be returned to your clients fast and will save you money on labor, and possible warranty replacements. And when your partner offers a direct customer ship and return depot, you can cut out the "middle man" for even faster services and happier customers. Don't settle for less than the best. Insist on these services from your electronic contract manufacturer. Are you ready to get started?